Muscle atrophy, the wasting of muscle tissue, has various causes, including sedentary lifestyle, aging, arthritis and spinal cord damage. This condition falls into two categories: disuse atrophy, in which the loss of muscle tissue is due to reduced physical activity, and neurogenic atrophy, in which the nerve that connects to the muscle is injured or diseased. Ask your physician or physical therapist to help you create an individualized exercise program that will allow you to regain muscle tissue. Disuse atrophy occurs in office workers because they get little exercise sitting all day. Sit on a fitness ball to incorporate new movements into your day. This will automatically tone your core muscles in the abdomen, hips, shoulders and back. In addition, store fitness equipment, such as hand weights, in your desk, and do a set whenever you have a few minutes. Disuse atrophy is a natural consequence of aging, but this does not mean that you should passively accept lost strength. The Centers for Disease Control and Prevention suggests exercises such as squeezing tennis balls to increase grip strength and doing chest presses with small dumbbells. In "Strength Training Benefits Elderly Participants," Dr. Wayne L. Wescott describes two studies he and his co-researchers conducted doing various types of strength training with elderly nursing home residents. In both cases, study participants gained lean muscle weight during a four-month training period. Multiple illnesses, such as arthritis, can trigger disuse atrophy because patients become inactive or spend a lot of time in bed. According to a 2002 study done by researchers at the School of Nursing at the Johns Hopkins University, disuse atrophy begins within four hours after bed rest commences. The Arthritis Foundation offers ideas on how you can build strong muscle around arthritic joints, and recommends a weight-lifting program specifically geared to people with rheumatoid arthritis, a 12-week walking program and water exercises. The most difficult type of muscle atrophy to treat is neurogenic atrophy, in which nerves connected to the muscles are diseased or injured, but patient advocacy groups often have exercise ideas. 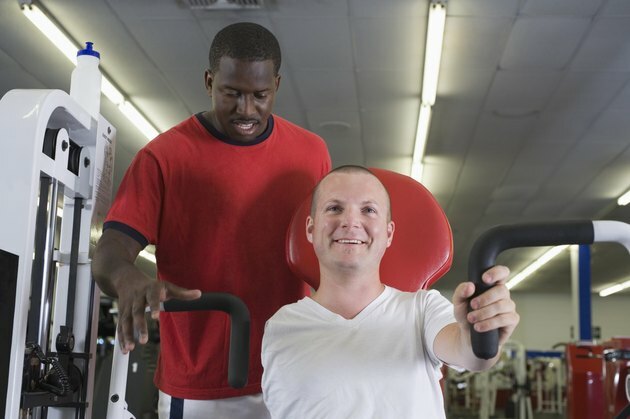 For example, the Christopher and Dana Reeve Foundation's Paralysis Resource Center describes how special types of assisted exercise for spinal cord injury patients, including cycling, walking on a treadmill and exercising in a swimming pool, can restore muscle tone, stop osteoporosis, improve general health and restore some limb function.